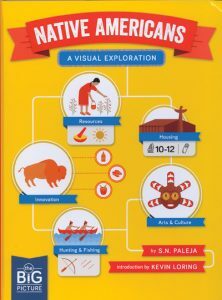 This new book for elementary school readers surveys the history and culture of the first peoples of North America using colourful infographics—charts, maps, pictographs and timelines. Organized into six chapters (Origins, Tribes and Society, Plants and Animals, Culture, Making Contact, Modern Day), an amazing amount of information is presented on these 48 pages. Classroom Connections: Native Americans presents an overview of the indigenous people of North America that could be used to teach a unit on this subject or to provide a stepping stone to more in-depth research projects. This book would also be useful to teach how information is delivered in non-fiction titles.